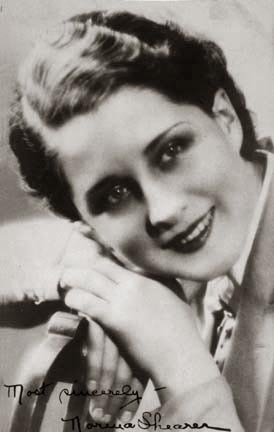 Norma Shearer (her real name) was born in Montreal, Canada, in 1902. Her father was supposedly a manic depressive, but herr mother supported Norma in her desire to be a concert pianist in her early years. However, by the time she was nine, she decided she wanted to be an actress after seeing a vaudeville show. When she was 16, her sister, Athole, suffered a serious mental breakdown, and her father's company folded which resulted in the family living in near poverty. Her mother took the two daughters and left her husband. She sold their piano and bought tickets to New York. She had also acquired a letter of introduction for Norma to Florenz Ziegfeld. The three women arrived in New York in January 1920, but the meeting with Ziegfeld was a disaster as he criticized her lack of beauty. Shearer and her sister went to Universal where they heard extras were being sought. Norma was selected. She later got an extra part in "Way Down East" (1920). When she confided her aspirations to D.W. Griffith, he flatly told her she'd never make it. One of the reasons she was not encouraged by these men was a supposed "cast" that seemed to show a cross-eyed effect to her eyes. After consulting a specialist, she resorted to daily exercises to correct this "cast." Her drive for success also took her to theatrical performances where she studied some of the great actresses of the day. Needing money, she turned to modeling for such soap, soft drinks, Kelly-Springfield Tires and more. A break came her way when she got fourth billing in "The Stealers" (1921), a minor picture. In February 1923, she received a telegram from Irving Thalberg offering her a contract at Louis B. Mayer Pictures. Her start was tentative as she was nervous and got called to Mayer's office one day for not getting along with the director. Mayer chewed her out, and she then became determined to "show him" and went back to the set to do a commendable job. When the merger of Mayer, Samuel Goldwyn Company and Metro Pictures took place in 1924, she was cast in the company's first production, "He Who Gets Slapped" along with Lon Chaney and John Gilbert. Within the next year she was starring in her own pictures and earning $1,000 a week. Over the next few years, her pictures, though light fare, proved to be successful and her relationship with future husband Irving Thalberg blossomed. She got her first part in a prestigious picture when she was cast in Ernst Lubitsch's "The Student Prince in Old Heidelberg" (1927). It was at this time that Thalberg proposed, and they were married September 29, 1927. When talkies arrived, Shearer's first talking films proved to be a success, a claim that many of the former popular silent screen stars could make in their talkie debuts. She went on to star in many prestigious MGM films such as "The Barretts of Wimpole Street" 91934), "Romeo and Juliet" (1936), "Marie Antoinette" (1938) and more. She was nominated for the Best Actress Oscar six times but one only once for "The Divorcee" in 1930. Thalberg died in 1936, and Shearer retained a lawyer to ensure that Thalberg's estate received the profits from the films with which he had been associated. In spite of a contest from MGM, she won. She continued to be a major star at MGM and after affairs with James Stewart and George Raft, she married Martin Arouge, a former ski instructor who was 12 years younger than she. She retired from films in 1942, and she and Arrouge remained married until her death in 1983.